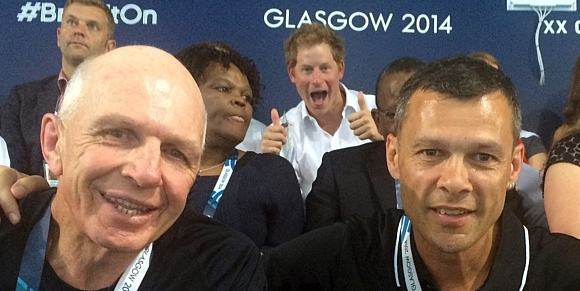 Prince Harry outdid his grandmother to become the latest Royal to pull off a ‘photobomb’ at the Commonwealth Games. Fun-loving Harry posed in the background of a photo taken of New Zealand rugby sevens coach Gordon Tietjens with former Olympic boxer Trevor Shailer and sports psychologist Gary Hermansson. Harry seemed to be having a great time at Tollcross International Swimming Centre, posing with his mouth open and thumbs up. Trevor Shailer, who is the New Zealand Commonwealth Games team’s deputy ‘chef de mission’, posted the picture on his Facebook page on Monday night and seemed to like the snap so much he later made it his profile picture. The photo featuring the 29-year-old royal comes just days after the Queen made a surprise smiling appearance in a selfie taken by two Australian hockey players. Jayde Taylor and Brooke Peris added to their collection of royal snaps after also getting a picture of Harry with their team on Monday. Prince Harry was visiting the Games with the Duke and Duchess of Cambridge. They were sitting just a few rows behind the New Zealand delegation while watching the action at Tollcross International Swimming Centre.